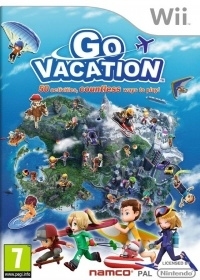 Go Vacation looks like a procedural mini-game collection. Beneath this veneer is a four player open-world adventure that will keep you happy for longer than either Zelda or Skyrim. I have a self appointed responsibility to highlight overlooked games with a family bent. Having built up a bit of a family following this has become increasingly difficult. I'm often beaten to the punch. Go Vacation is one such game. 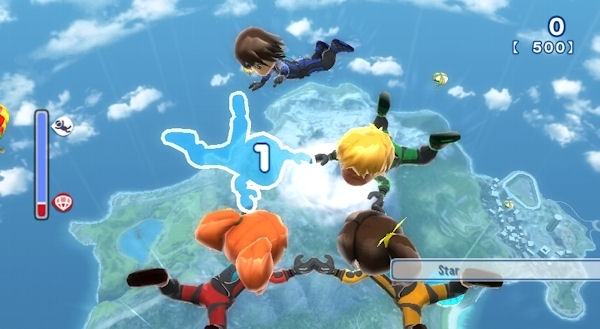 I had thought it was another of the derivative mini-game collections on the Wii, and being more than happy with the Wii-Sports and Wii-Sports Resort collections (baring a MotionPlus version of Tennis -- something I'll return to below) I passed over it. What I hadn't realised was that this was in fact a follow up, in disguise, to one of my favourite Wii games Family Ski (We Ski in the states). This was missed by many in the first couple of years on the Wii, and followed up with a Balance Board enabled version called Family Ski and Snowboard (We Ski and Snowboard in the states). Family Ski looked like a simple skiing game with motion controls - you hold the Wii-mote and Nun-chuck like ski poles and then sway to steer. In fact it was much more interesting. Firstly there was a huge mountain landscape that you could ski around as much as you wanted. Crossing a start line would then seamlessly trigger a timed run that earned you awards and clothing through the various slalom, moguls and downhill challenges. But as well as this there were hundreds of people to talk to, items to collect and missions to go on. I spent just as long making friends, collecting lost recipe ingredients and helping fallen skiers as I did racing. 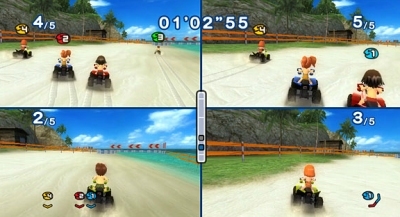 On top of this you could play the game in four player split screen mode and each progress you character simultaneously or race each other. Finally the simple controls (not quite as simple as Shaun White's Snowboarding but close) are easy enough for anyone from the age of four up to play. My kids (3, 5 and 7 at the time) could all play together with minimal assistance. The real fun is in exploring. 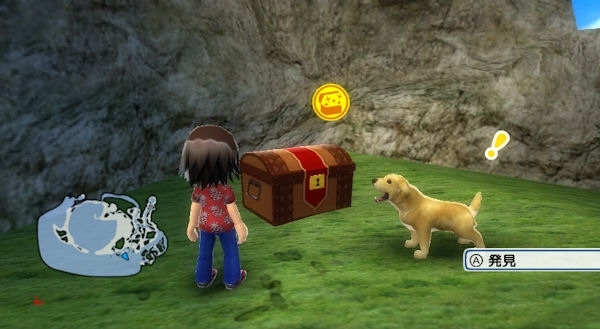 Fetch quests, picture spots, balloon messages and hidden treasures. Put simply Family Ski was a four player open world skiing adventure. There was, and has been, nothing like it on the Wii. That was until Go Vacation, as I was informed by one of my family gaming friends recently. 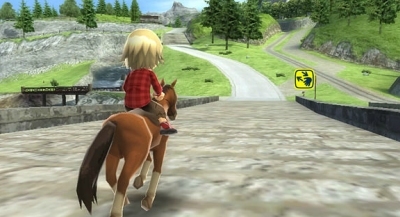 Go Vacation takes the basic Family Ski engine (which looks amazing on the Wii and makes great use of Mii's) and expands it across a four resort island and 50 different activities. It was obvious from the look and feel of Family Ski that there had been a substantial investment in the engine, which meant I had been expecting further sequels to capitalise on this. Go Vacation does this by rendering four very different resort environments: City, Beach, Ski and Mountain. Each location has its own motion controlled mode of transport and range of missions, sports activities, collectibles and mysteries to solve. 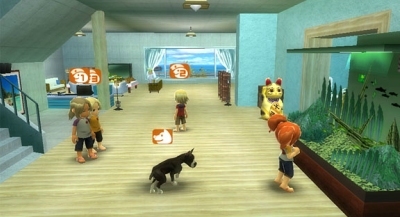 Each starts off by directing you to completing a series of mini-game based challenges. 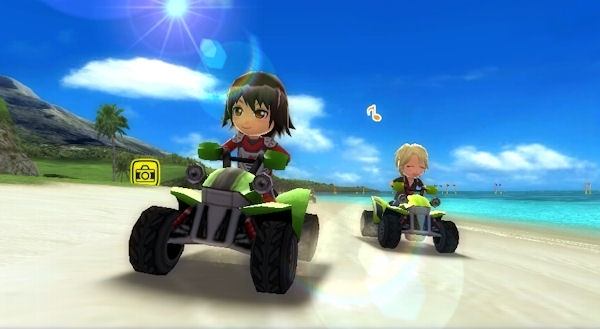 These include JetSki, ATV, Surfing and Skiing activities similar to Family Ski, but also more sport-centric based games like Volleyball, Tennis and Skating. Each of these mini-games knows their limits and keeps things on the simple side. But within these bounds there is a good degree of control to learn and develop. I know that some people have found the controls a little lose or frustration -- but I think that is part of the charm, that you have to put the time in learning each of them. Put simply it's a four player open world skiing adventure. 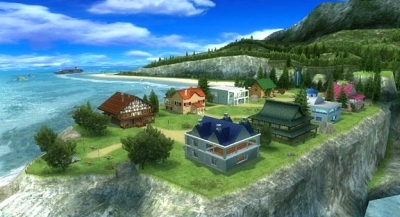 As you unlock each of the locations the game opens out and you realise that the real fun is in exploring. Fetch quests, picture spots, balloon messages and hidden treasures in each resort incentivise you to explore. The locations are huge, taking a good ten minutes to walk across (and thankfully each provides their own public transport system). 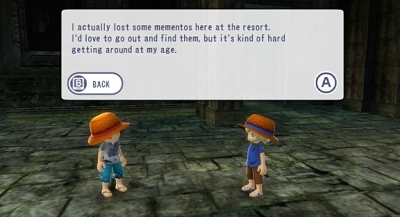 As you explore you can also drop in and out of the mini-game activities without actually performing a competitive task. This gives you space to practice as you explore and was a key element to the open world feel of Family Ski. Go Vacation does change the formula a bit. Whereas speed runs could be triggered in the original game by skiing through a start gate, here you have to trigger an actual competitive event if you are to be scored. 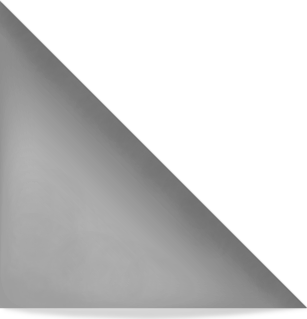 The other slight negative is the inclusion of the MotionPlus symbol on the box. 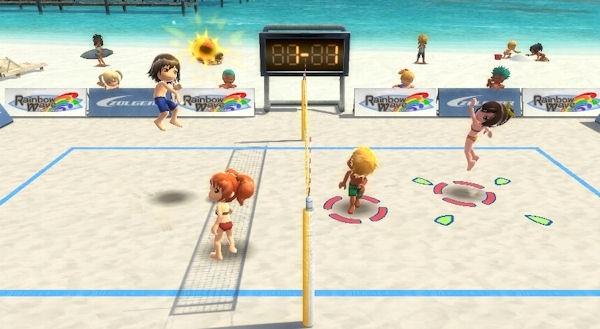 In truth there is only one mini-game that uses MotionPlus, tennis. 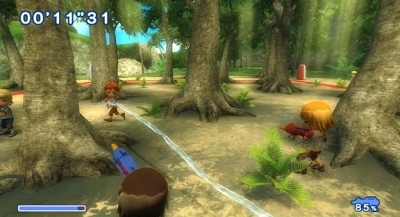 Although this doesn't offer the exquisite one to one control of Wii-Sports Resort Table Tennis it does do a solid job or providing a version of Wii Tennis where you can control drop shots and lobs and player movement at the same time as a swing mechanic. 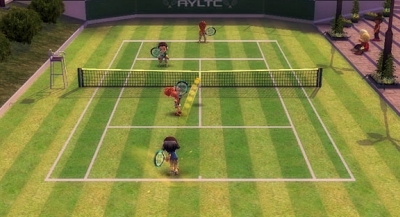 The attention to detail and good design decisions of the tennis game result in the best Wii tennis experience since Wii-Sports and Grand Slam Tennis (Ed: I'm still smarting from the lack of a Wii Grand Slam Tennis 2 in favour of 360 and PS3 versions). 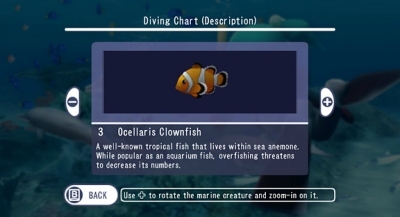 This is typical of all 50 activities that do a good job of being great fun and capturing the spirit of the real world activities in a way that similar Wii title Sports Island never quite managed. It's the kind of game that makes me wish I gave videogames scores out of 10. All this means that Go Vacation joins Endless Ocean (Wii), Pac n Roll (DS), Leedmees (360) and Wipeout HD (PS3) as my go to family gaming suggestions. Don't miss out on a real treat, and a great reason to dust of your Mii's -- and perhaps that diminutive white console that lies buried beneath your TV. It's the kind of game that makes me wish I gave videogames scores out of 10. If I did I would only have handed out a few 10's on the Wii, and Go Vacation would have got one for sure.